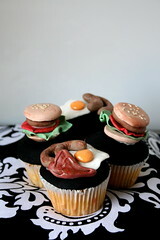 I know this has nothing to do with cakes...AND I'm an Australian not an American, but I just had to post it!!!!! 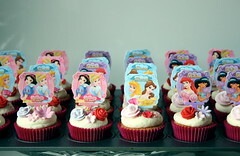 Hand made icing decorations on cupcakes for the Disney Channel shoot! 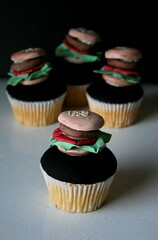 Hand made "dinner" decorations form icing......on cucpakses...for the Disney Shoot! 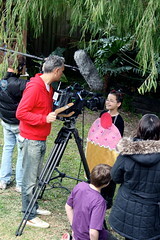 A 5 minute decorated cupcake for the Disney Show. 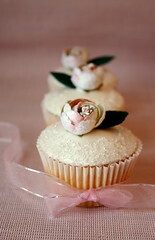 I had to redo another cupcake I had made for the shoot...luckily I had pre made decorations on hand for it! 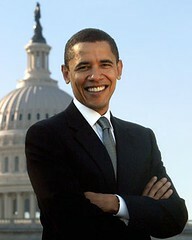 Amazing what one can do when under pressure! 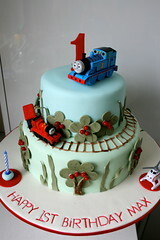 2 tiered Thomas the Tank Engine Cake. 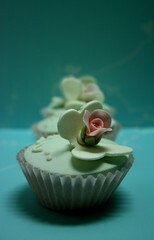 Vanilla heaven with buttercream covered in fondant. 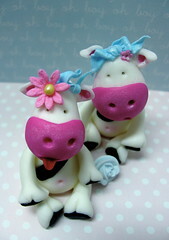 The figures are plastic & are not edible decorations. 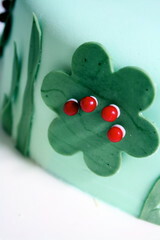 All other decorations are edible. A flower...... no a tree! 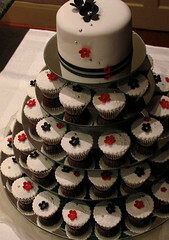 Our popular lace embossed cupcakes with a matching top cutting cake.......on our custom made & designed tiered stand exclusive to "Le Cupcake". Just informing customers that I have a display room, & do not have a shop front. The reasons for this are many. 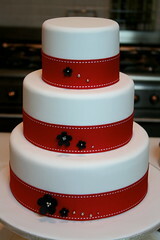 I cannot decorate the cakes I do as well as front a shop. 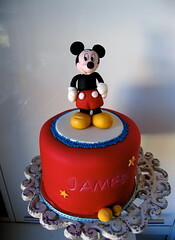 I supply custom one of a kind quality cakes, not mass produced, not cakes from mixes, I don't buy them, they are all baked by myself, & decorated by myself, so that unfortunately leaves no time to front a shop. 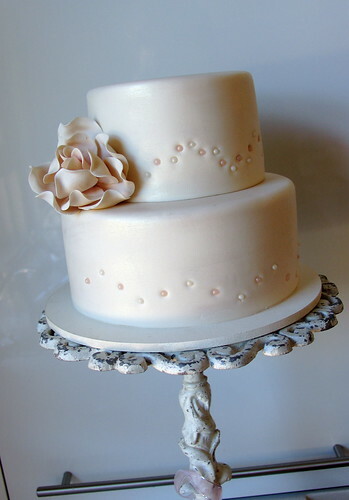 As most people know, alot of people in the cake industry don't have shop fronts due to similar reasons, & to the high costs involved. In my local area they are charging $1600 rent per week for some shops. Add to that the renovating costs (& the fact they may make you leave after the lease is up) the electicity, gas, water, etc etc....It's extremely expensive. Then, unless you are willing to pay thousands per week to be in a Westfield shopping centre, you wont get the passing trade as they do. 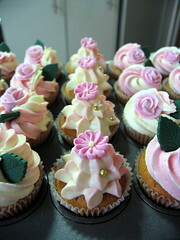 So, having a shop is not viable for my business, & would also detract from the time needed to make my cakes. 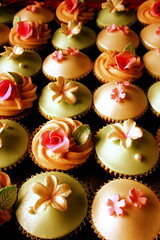 If you think it is unprofessional not going to a shop to conduct your business, then please keep these things in mind. 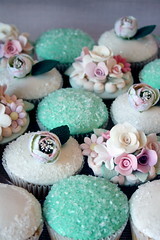 You will find few that provide the highly decorated cupcakes as I do, for the same reasons I have outlined. I'm making this post for customers who do not realise this. 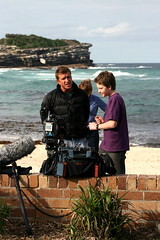 I do however have a display room in which I meet clients. At the moment this is unoperational & I apologise for this. 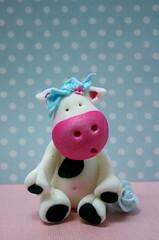 I am again remodelling due to an upcoming event. 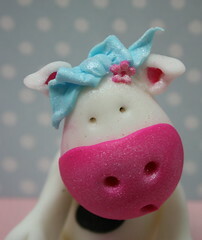 So I apologise for the inconveniece & hopefully it will be up & running shortly. We are making an attempt to stamp out negative bullying behaviour by a very small number of businesses..so please remember to play it nice. 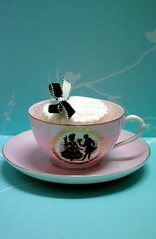 Concentrate on your business rather than trying to discredit other businesses. It makes our industry look bad when such behaviour occurs. So please don't engage in such behaviour, & if you have concerns with another business deal with them in person, or by phone or email, NOT on public internet sites or cake forums. It doesn't look good for the industry. 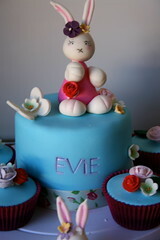 Hand made & designed edible bunnies on a top cutting cake (delicious vanilla heaven) & chocolate mud cucpakes with buttercream & sugarpaste tops. 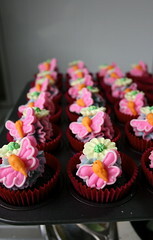 Hand made & designed edible bunnies on chocolate mud cupcakes with a layer of chocolate buttercream & topped with sugarpaste. 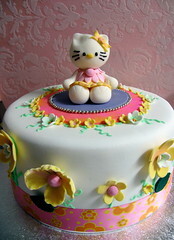 Hello Kitty Cake, originally uploaded by kylie lambert (Le Cupcake). 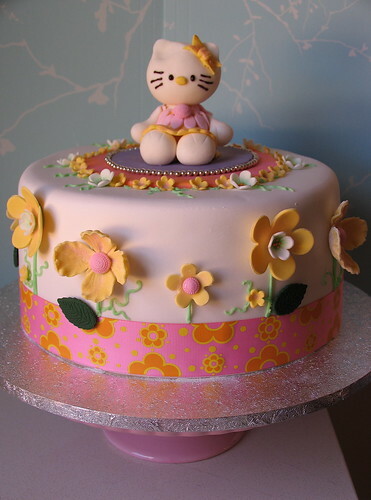 Hand made floral decorations & edible Hello Kitty. 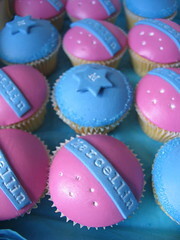 Another favourtie of ours....cupcakes with a frill design. 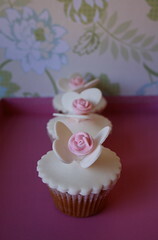 Mixed with classic rose & leaf cupcakes all in a 2 tone buttercream icing. 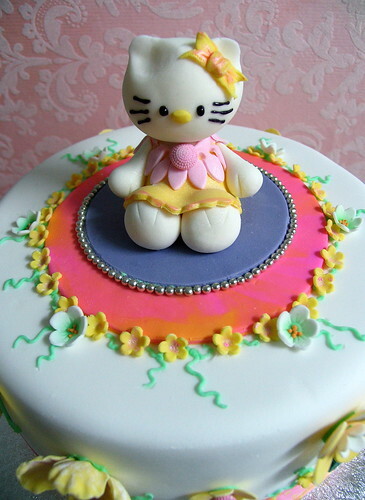 Hello Kitty edible figurine, originally uploaded by kylie lambert (Le Cupcake). 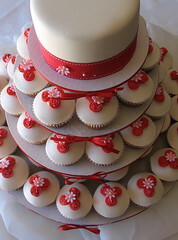 Everything is edible on this cake excpet the bottom ribbon. 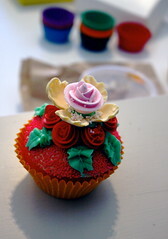 Non edible Princess cupcake pics with edible flowers & roses on chocolate cupcakes. 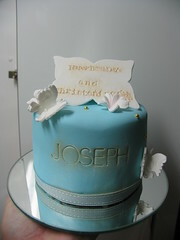 Christening cake for Emily, originally uploaded by kylie lambert (back from holidays - sort of). 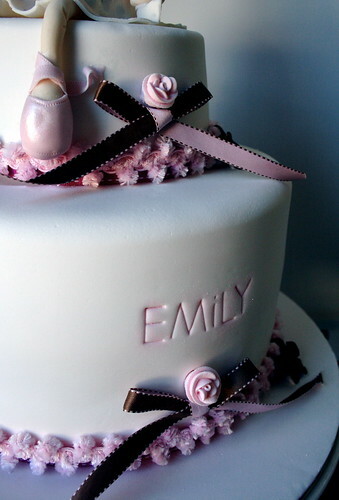 Close up of the christening cake for Emily. 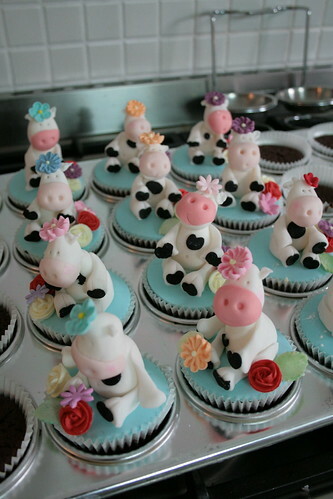 More Cow Cupcakes, originally uploaded by kylie lambert (Le Cupcake-Australia). My "Baked from scratch" (like all my cakes) chocolate mud cakes are devine & I get continual feedback from people saying they are the best cakes they have tasted! 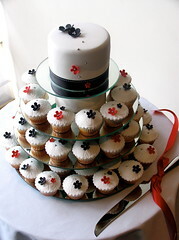 For more photos, hit the "older posts" button at the bottom of the page. 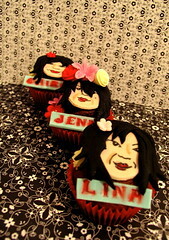 Chocolate mud with buttercream personalised cupcakes. 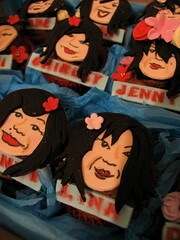 Everything is edible including the character faces which were personalised from photos of each party guest. 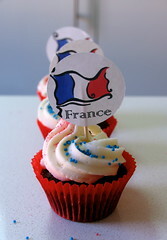 Each cupcake was personalaised for each guest at the party! 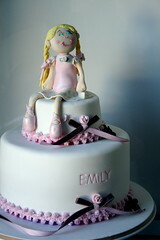 Personalised to look like the birthday girl! 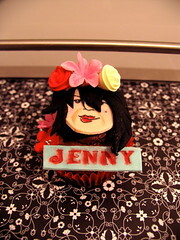 Edible face caricature on chocolate buttercream atop chocolate mud cake. 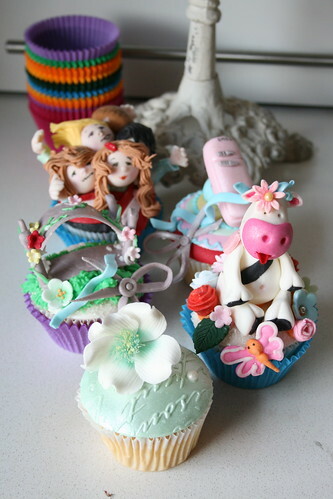 Peter Rabbit cupcakes, originally uploaded by kylie lambert (Le Cupcake-Australia). 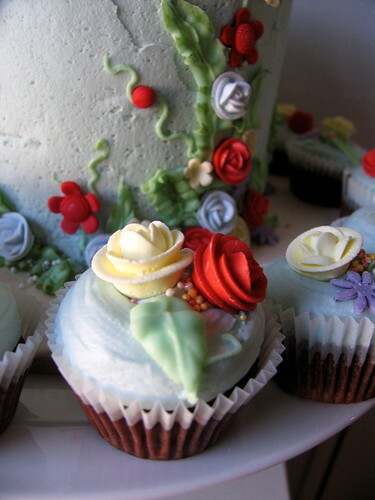 Chocolate cupackes with siugar flowers & decoration, to go with the Peter rabbit Cake. 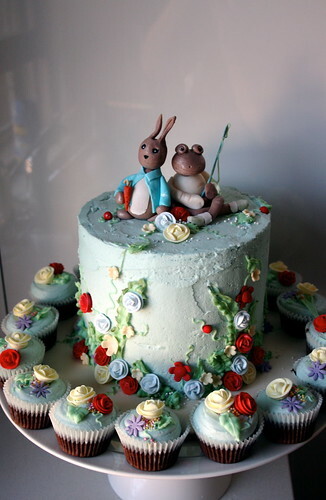 Peter Rabbit & Jeremy Fisher, originally uploaded by kylie lambert (Le Cupcake-Australia). 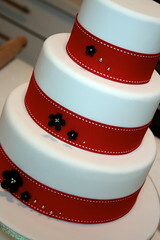 We have a gorgeous new wedding cake range. 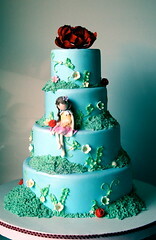 These cakes are unique & beautiful!! 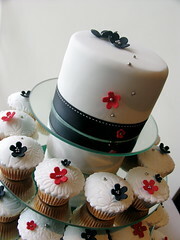 Photo shoot cake, originally uploaded by kylie lambert (Le Cupcake-Australia).